That is what the sky looked like when we leave the house and visit another City for a very important appointment. 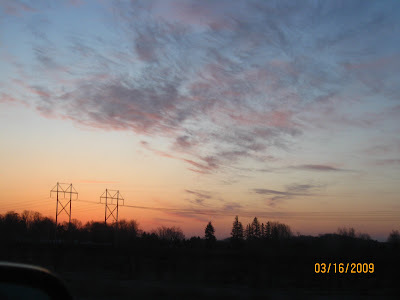 I love the sunrise that's why I took this picture as you may see there are many different colors above which I really do find interesting and amazed. Such delicate textures. Very lovely. The morning light is so wonderful! Cheering dawn into the daylight just ahead! Lovely dawn, pity about the pylons. 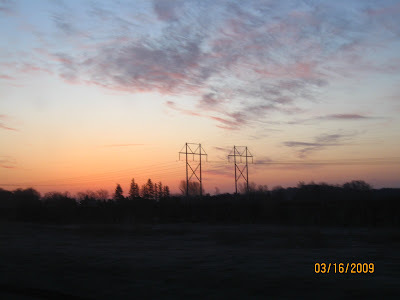 Dawn awakens the powerlines too...great sky...that makes it all worth having to get up so early! I would wake up early to see these beautiful skies. Nice pictures!